If you’ve seen “The Lego Movie,” I’ve just triggered that obnoxious, earworm of a song to start playing again in your head. You’re welcome. I’m aware that most critics loved this movie. It’s smart, cynical, funny and contains maybe the best CGI effects ever done. But where the “Toy Story” movies to which it’s being compared always honored story above spectacle, spectacle drives “The Lego Movie” like a runaway train. Somewhere beneath a 90-minute frenzy of incredible visuals, gags and video game action, there really is a story. But by the time we reach the final act – 10 minutes which are surprising and sweet – I was too exhausted to care. Spectacle can decorate a story incredibly well, but it can’t tell a great story. For that we need deep characters, an absorbing plot and a universal truth underlying the whole thing. Spectacle can obscure story in real life, too. 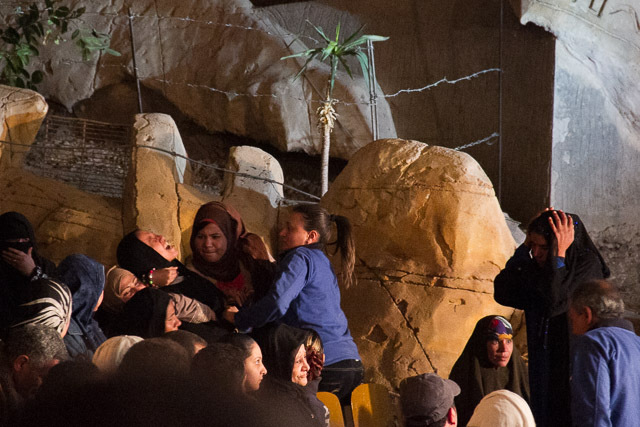 In March, Lincoln and I attended a Coptic church service in a huge cave outside Cairo, Egypt. As the congregation sang worship songs and the priest delivered his sermon, commotion came from a section where about 75 Muslim women sat. Many of these women, we were told, come to the church often to seek healing. Every few minutes, different women would begin screaming and thrashing, as church staff would restrain them and pray for them. Demonic activity, psychological distress … whatever it was, as a visitor my attention was drawn to the spectacle a few rows away. A church worker (in blue) restrains a women screaming and thrashing violently during the Cave Church service. But as I look at our photos from that service, something else stands out. The men and women sitting near these distressed women seem to barely notice the commotion. They’re locked in on the sermon or the worship music. See, the larger miracle in the Cave Church is not that exorcisms are happening. It’s that people are coming to Christ in droves. Grace – free, undeserved favor and redemption – is the underlying universal truth playing out among this plot, these characters and yes, this spectacle. This entry was posted in Culture, Reporting, Story and tagged culture, movies, story. Bookmark the permalink.